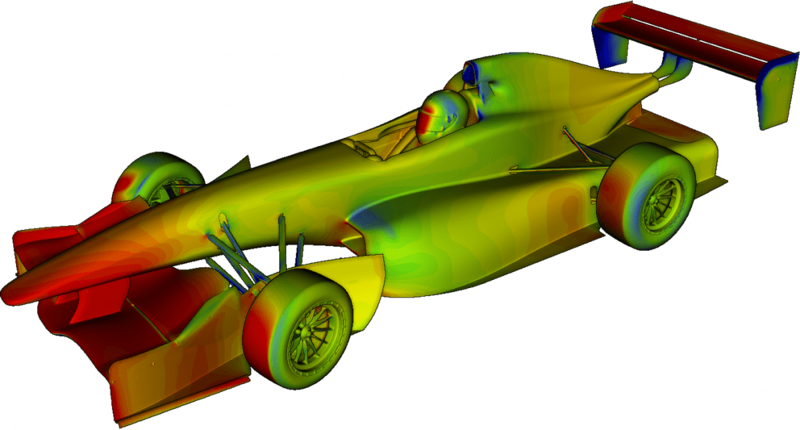 Welcome to the second part of a three-part series by former Head of Aerodynamics at Benetton, Ferrari and Sauber F1, Professor Willem Toet, who exclusively explains CFD Post Processing in depth. 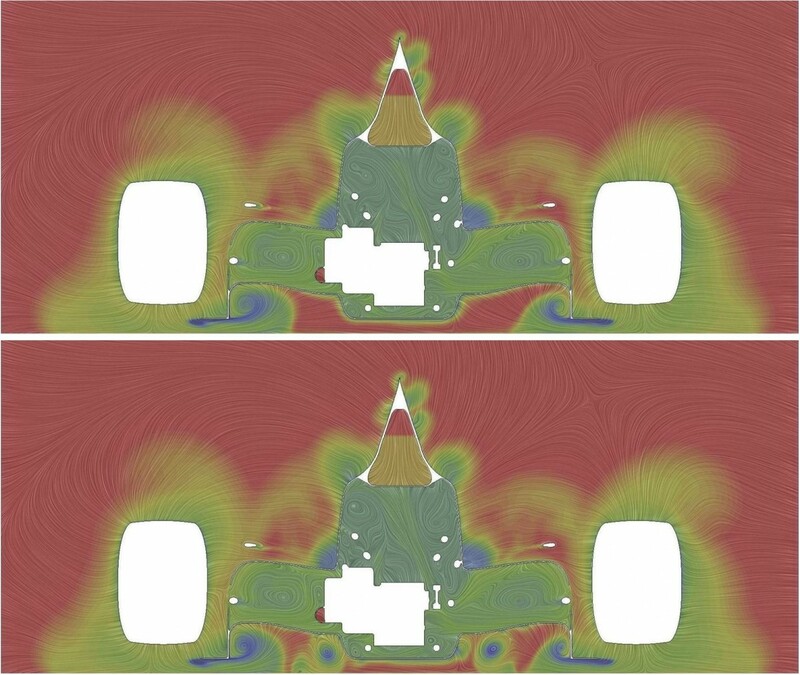 So called X-Ray plots do pretty much what they say and can be created in any direction so you can look at, for example, drag, downforce or side force. 27a and 27b. X-Ray plot of downforce on a generic GT car. The plot is created by adding up all the pressures acting on all surfaces of the vehicle and is created in a zoned way. The size of the zones for this calculation can clearly be seen in the image. These can be particularly useful when you’re first learning. I haven’t used them for F1 but I have wanted them when working on other projects to allow communication about the distribution of drag and downforce (in particular). They can be particularly useful when comparing quite different geometries (e.g. looking at lift and downforce distribution differences). Also they are useful for looking for sudden changes of lift to downforce and for areas of high lift / downforce far from axle centrelines (like the front downforce generation here – car may be peaky). Thanks to TotalSim. Aerodynamicists will sometimes look at a view of a whole car when assessing the aerodynamics. They will, more likely, want to look in much more detail. Often, they will want to look at images that show them what the airflow is doing inside bodywork, brake ducts, and in the air around downforce generating elements. One way of doing this is to create slices of airflow information in planes around/through the car. 28. This is a cross section through the car somewhere close to rear axle centre line, and shows Cp (coefficient of pressure = “static” pressure). See how the static pressure under the car is lower than it is above. 29. This longitudinal cross section shows CpT (total pressure = energy in the flow relative to the car). With this type of plot, you can get an initial idea about how effectively aerodynamically important items have been places. If you put something into a blue (very little energy) area, you cannot expect it to do much. So a plot like this can tell you where you still have high energy air to play with. with the addition of LIC (line integrated convolution) = simulated oil flow in the plane of the image. 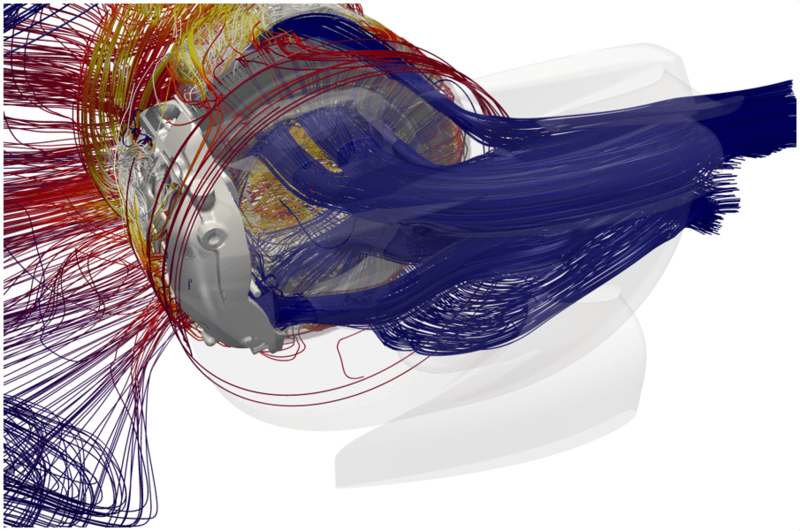 An important part of setting up and running CFD cases is to decide how much detail and accuracy to use in areas that are, relatively, aerodynamically, less important. You will need accuracy to get the correct information in areas where airflow is much slower than free stream, so you need to ask yourself how much effort you want to spend there. In F1 we clean up details in some slow-moving areas to make the calculations faster – aware that some internal details will not be correct. 31. This cross section just in front of the side pods of an open-wheeled race car shows some aflow structures created by the wheels and by the front wing / end plates as well as a barge board. Image, as many here, courtesy of TotalSim – CpT with LIC. 32. Horizontal cross sections (of CpT in this case) like this give some particularly useful information. This slice cuts through the (open-wheeled) car at about mid-wheel height. These plots take some time to understand. The suspension is sending low-energy air into the side pods so could be improved, and tyre wakes are pulled in towards car centre line (very different to F1 today). These images can be stored separately or stitched together into movies. There are many ways to compare different cases or different running attitudes (height, yaw, steer etc.). extracted by a user manually it would be unlikely that they would overlay precisely. 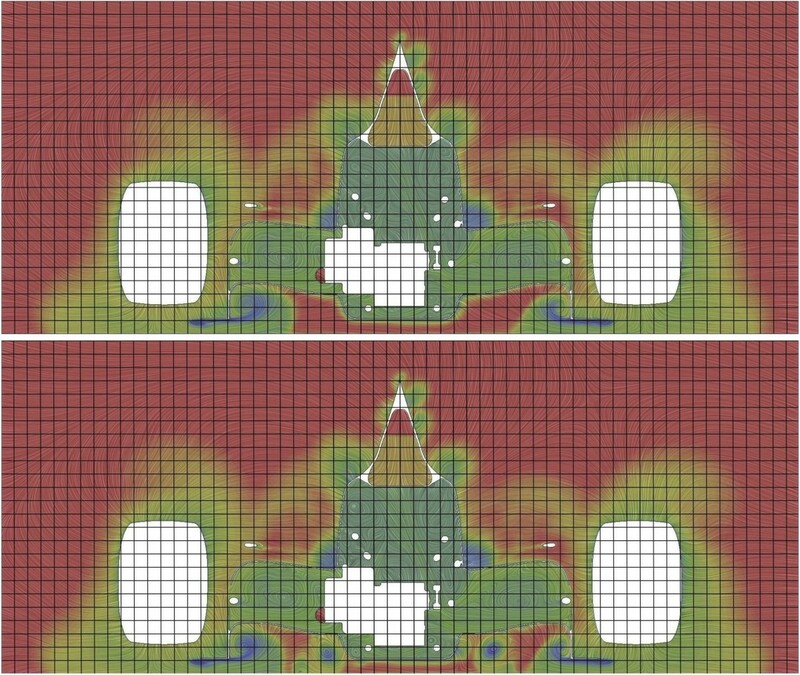 of the change of wing position as well as some of the pressure changes. take a little while to get used to because the scale means something very different to an absolute plot. where the geometry is not the same. front wing change has created changes in rear wing forces as well as change further forward. of your measurement parameter so you can see changes in more detail. by side comparisons are still used as a standard way of comparing cases. they have elsewhere is not so obvious. 46. Just add some reference lines that are in the same places in each case. Now you can measure flow feature positions with a much smaller zone. When you want to study flow in detail, you need a fine (high quality) mesh and high-resolution images. Even in F1 I’ve had people try to analyse the presence of a 0.5mm step when the mesh size is of about the same size; the maths and method used is against you! My friend Torbjörn Larsson at Creo Dynamics pointed out, quite correctly – “One thing I often stress is the importance of mesh consistency while making design changes. If you replace one particular part, try to keep the rest of the mesh the same as far as possible. More than once, I’ve seen people making design improvements “polluted” by unwanted mesh effects…” Just love having useful feedback to improve things – obvious to those who have been in the business a while but worth stating for sure. You will see in the report further down that the overall test vehicle is broken down into sub components. It follows that pictorial analysis could also be used for these sub components. 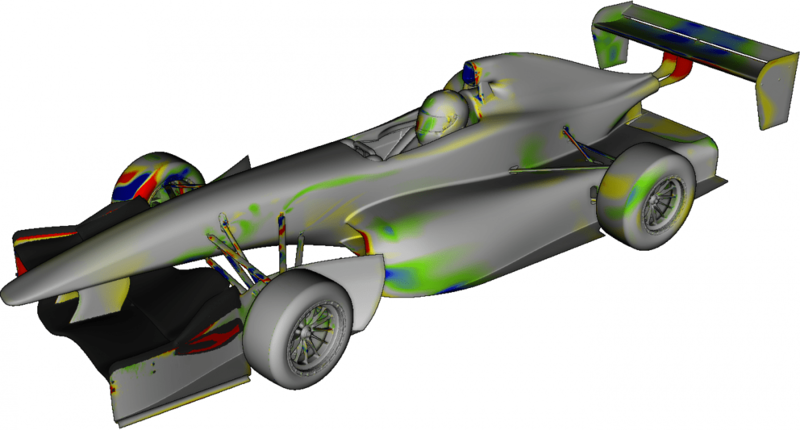 In F1, with big resources, we look at many areas in detail, also pictorially. An obvious area may be radiators or brakes for cooling (velocity, pressure drop, shear stress) etc. 48. Normalised velocity through a radiator core. This is a large core with a velocity range of 5% to about 15% of vehicle velocity. 49. Flow lines showing the paths of air passing into and out of a formula car brake system. This won’t be an issue if you have a single attitude for your testing – which is OK for learning how things work but cannot be the long-term goal. For looking at forces on a racing car, using a frame of reference at ground level makes complete sense because that is where forces are resolved. For other types of analysis it depends… For pictures, if the frame of reference is the ground, then the ground and (mainly) wheels stay “still” while the car moves around (ride height changes etc.). This makes looking at changes on the bodywork and, in particular changes on internal surfaces (cooler ducts or coolers for example) harder. 50. Example of how an attitude change will look if you use the ground as the reference frame for post-processing of images. If the frame of reference is the car, different car attitudes will result in the ground plane, suspension, steering, wheels and tyres moving around relative to the car body. If the change in car attitude is large it doesn’t matter – the body stays in the same place in your images, and changes in aerodynamic parameters on the body can be directly compared. For wheel-related items, e.g. brake ducts, a special frame of reference is worth creating so that these can be compared with ease (e.g. different ride heights, roll angles. steered vs. straight ahead, vs.yawed). So, the message is – think ahead about what you will need from your post-processing and create tools to suit the needs of the project both shorter and longer term.